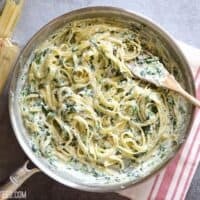 This quick and luxurious Spinach Ricotta Pasta boasts a creamy and garlicky spinach sauce made easy with ricotta cheese. Place the frozen spinach in a colander to thaw while you work on the pasta and sauce. Bring a large pot of water to a boil and then add the pasta. Let the pasta boil until al dente, then drain in a colander. Reserve about 1/2 cup of the pasta cooking water to help loosen the sauce later if needed. While the pasta is boiling, prepare the ricotta sauce. Mince the garlic and add it to a large skillet with the olive oil. Cook over medium-low heat for 1-2 minutes, or just until soft and fragrant (but not browned). Add the milk and ricotta, then stir until relatively smooth (the ricotta may be slightly grainy). Allow the sauce to heat through and come to a low simmer. The sauce will thicken slightly as it simmers. Once it's thick enough to coat the spoon (3-5 minutes), season with salt and pepper. Squeeze the thawed spinach to remove as much excess water as possible (squeeze it in your fist), then add it to the ricotta sauce. Stir until the spinach is distributed throughout the sauce. Taste and adjust salt or pepper if needed. Turn the heat off. Add the cooked and drained pasta to the sauce and toss to coat. If the sauce becomes to thick or dry, add a small amount of the reserved pasta cooking water. Serve warm.